In the Projects tab, you get an overview of all the Active Projects, Project Templates, Archived Projects, and Trashed Projects. Click the Projects tab in the top navigation bar of your company portal. What you view here, is the overview of all the project related data in your company. You can view the list of active projects categorized group-wise, client-wise, and owner-wise. The Active Projects section lists all your ongoing projects in the portal. Click Projects in the top navigation bar. Click the drop-down panel. By default, you View By Group. Your Recently Accessed Projects are listed separately for your reference. Click View By Client to view the list of the projects client-wise. The client names are sorted alphabetically and their respective projects are listed under their names. Click View By Owner to view the list of the projects owner-wise. Like how you view the projects based on their clients, you can view them based on their owners as well. Hover over a project and click to edit or trash. If desired, you can update the auto-generated Task & Issue Prefix with a new prefix. For example, if the Task & Issue Prefix is reset as TW, then the task and bug ID will be TW-T1 and TW-I1, where T is for Task and I is for Issue. Update the Project Status from the list of customized project status if necessary. Modify other project information, wherever necessary. Project fields can be edited inline. Click on a field in the list view to edit it. old invoices and create a new one. This section lists the projects that have been archived. Click Archived Projects. Refer the following section to learn how to archive a project. Navigate to Projects in the top navigation bar. Hover over a project and click . When you archive a project, it will be moved to the Archived Projects section. You can archive and unarchive projects based on your convenience. Click Move to Archive in the alert. You can also archive a project from the Project Dashboard. 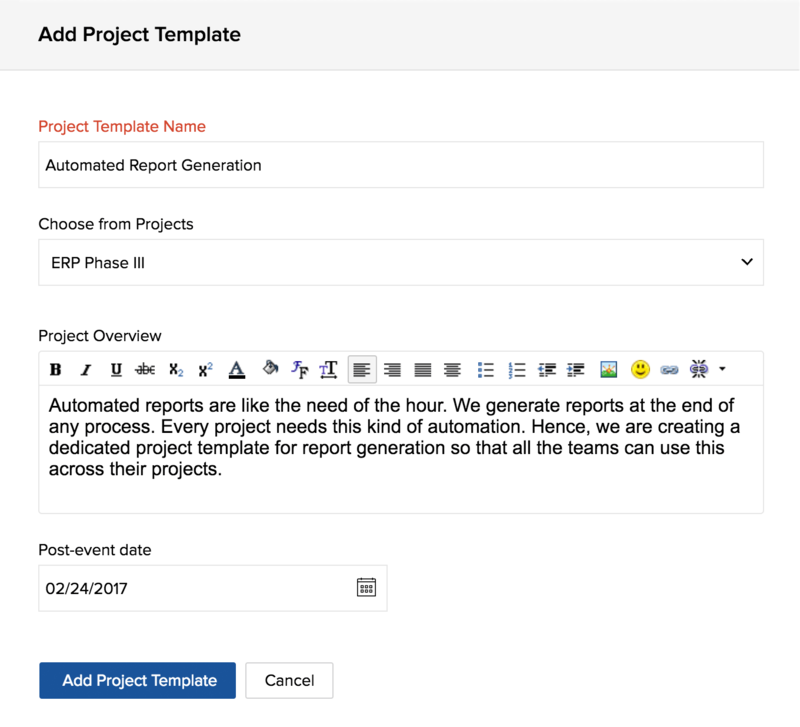 Click Project Templates in the drop-down panel. Give a Project Template Name. Choose a project from the list of projects to create a new template. Give a suitable Project Overview. Hover over a project from the list and click . Click Trash Project to discard a project. When you trash a project, it is neither active nor permanently deleted. It is moved to the Trashed Projects section where you can restore it or delete it permanently. 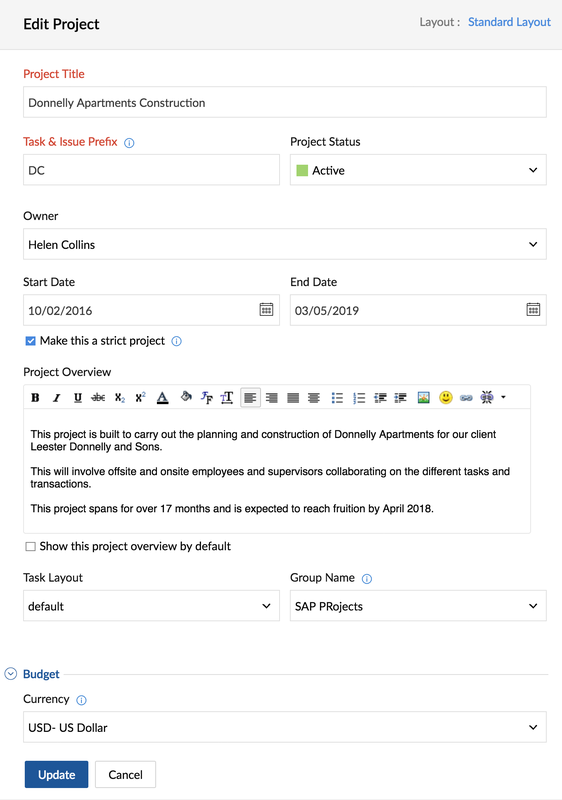 While Projects List View offers comprehensive details about your projects, the Projects Timeline Gantt gives you a consolidated view of your projects in a Gantt chart. Navigate to projects list view. Click on the drop-down panel and then click on Projects Timeline Gantt. View the gantt chart displaying all your projects and their timeline. Click on the project or the timeline to open the projects dashboard. Click and drag a line from the parent task to the target task in the Gantt chart to create task dependency. The chart displayed is plotted for 3 consecutive years - previous year, current year and next year. For instance, if the current year is 2018, the timeline gantt will show data from 2017 to 2019. Export your projects and their corresponding details from the Projects List View. This feature is available in all our paid plans. Click in the top right and the click Export Projects. A download URL will be emailed. The projects which you are a part of and made 'Public' by your Portal Owner are grouped in Public Projects. Users in the portal can now follow any public projects in the portal. Learn More. Hover over a public project and Follow it if you wish to. When you are Following it, you can hover over and Unfollow whenever you want. The projects listing shows Active, Public and Following projects for Managers, Employees and Clients. It shows Project Templates, Active and Archived Projects for the Portal Owner and Admins in a portal.